Find hotel near Garrison Savannah - Barba .. 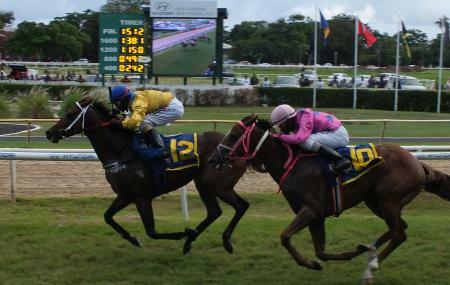 The garrison Savannah is one of the oldest horse racing tracks located in the city of Bridgetown, Barbados. You need not be a racing connoisseur analyzing which horse to bet on to visit the Garrison Savannah; all you need is to look forward to an entertaining day with a horse racing experience and local food in a brilliant atmosphere. Try the hot dogs at the savannah. You can bet on your favorite horse. Please check for open days or race days before visiting. How popular is Garrison Savannah - Barbados Turf Club? Wanna go to the horse races? Saturday horse racing rings out lots of people. Sitting in the 'Owners & Trainers Bar' section of the stands gave a good view at the finish line. Bar service was courteous and prompt. Historic. Beautiful. Welcoming. The Garrison Savannah is mixed-purpose facility. It is home to a horse racing track (where the historic Sandy Lane Gold Cup is held) and sports a huge inner field. This field doubles as both the primary venue for rugby on the island and a favorite exercise circuit for locals. A place to spend time with the family and friends. Watch and enjoy the game of sports. .horse racing round the historic Garrison Savannah. Time capsule was recently built on the southern end of the race track. Parades are also held on location. Become a famous spot for fitness enthusiasts and training sessions. A historic place well worth visiting. I went for the Sandy Lane Gold Cup and it was a funfilled experience. When in Barbados it is a good place to visit.